Here at Laboratory Technologies, we deal with nuclear medicine technologists, radio-pharmacists and radiation safety officers each and every day. We get the chance to talk with thyroid patients quite often as well, when they call us with questions about our Bind-It™ Patient Care Packs. While we try our best to put ourselves into a patient’s shoes to understand how this effects them, it is still academic and not the real world. That all changed recently. We had the opportunity to meet a young mother who is undergoing radioactive iodine treatment for thyroid cancer. She graciously invited us into her parents’ home (where she was staying during her isolation) so that we could measure and document contamination. Being a mother of three, with her youngest being one year old, she is deeply concerned about exposing them to radiation from her treatment. She felt that by us being able to document contamination in her home, we would be able to demonstrate to the medical community and other patients that home contamination really is a big issue that is being downplayed to patients. Family members are being put at unnecessary risk, because it’s easy to ignore what you can’t see. The lady (we’ll call her Jane for the purpose of this article) was being treated for the second time with radioactive iodine for thyroid cancer. While it was obvious that she was very concerned about her own condition, she was much more concerned about exposing her children to radiation. She had decided to stay at her parents’ house for 2 weeks, isolated in their bedroom because it had it’s own bath. She had purchased an inflatable mattress and sheets to be thrown away, and was sleeping on the floor of the bedroom. Even the clothes she was to wear during the isolation period were being thrown away. In short, she was being ultra-conservative and paying very close attention to everything she touched or handled. Based on what we found, she was very wise. In order to measure and document our findings, we brought with us a very specialized device that is many times more sensitive than a geiger counter. Additionally, the device is able to positively identify that any contamination is I131. While we were expecting to find contamination, the level of it surprised us. In fact, some objects were as much as 7,200 times background level. Background level means what the measurement device “sees” in the absence of a radiation field. The fact that the area around the toilet was highly contaminated underscores just how volatile I131 is. Without meaning to be too graphic, the act of urinating – even when sitting down – causes the radioactive iodine to spread well beyond the toilet bowl. Flushing the toilet twice is helpful, but as we found, was certainly not enough to prevent contamination of the entire area around the toilet – floor and walls alike. 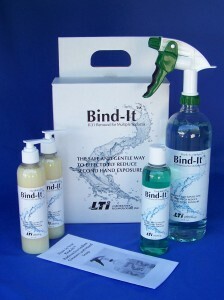 Equally interesting, is the fact that Jane washed her hands with Bind-It™ soap immediately before using her tablet computer or her phone. If she was using them for an extended time, she would put on disposable gloves. The result was that these items showed a very minimum level of contamination. Due to the fact that the garbage and bedsheets were extremely contaminated, we advised her to place all these contaminated items into garbage bags and store them away from others for AT LEAST 90 days before putting into the garbage. The level of contamination was so high, that it would set off radiation alarms at the garbage dump unless it was allowed to decay for an extended time. We will return to the patient’s house when her isolation period is ended, so that we can confirm that the contamination has been successfully removed. She will be using Bind-It™ Spray and concentrate to remove the contamination.